Racing in the silks of Stall Lucky Owner, AMARENA recorded a full point at her first time out at Duesseldorf racetrack today. The three-year-old SOLDIER HOLLOW filly was impressive in a powerful run in the final stretch that saw her drawing clear by nearly two lengths in the initial race of the card, a 2100 m maiden race for fillies. 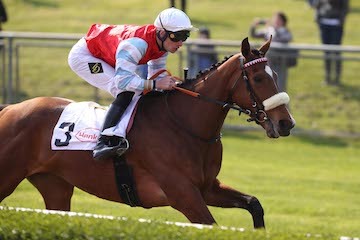 Lukas Delozier was aboard for trainer Henk Grewe.